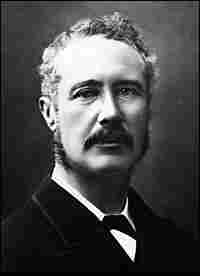 China And Sudan: A Marriage Sealed In Oil, History In the late 1800s, British Gen. Charles Gordon made a lasting impression in the complex relationship between Sudan and China. The discovery and exporting of oil has kept the connection alive. The first of a five-part series. Charles Gordon, circa 1880. Born in 1833, he was murdered on the steps of the palace in Khartoum in 1885. 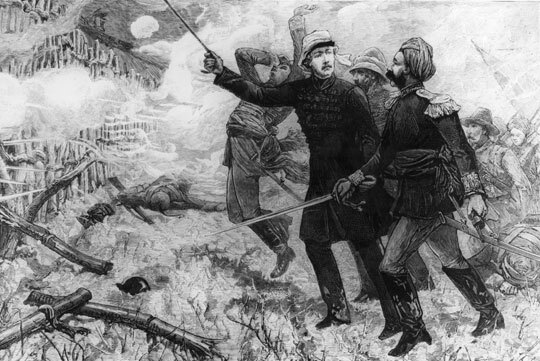 Charles Gordon leads an attack against the Taiping rebels in this 1864 drawing. China is now Africa's third largest trading partner. But as its profile has grown on the continent, so have concerns about Beijing's hands-off policy on internal affairs and human rights' issues, from Sudan to Zimbabwe. The relationship between Sudan and China is widely believed to be a marriage anointed in oil: China needs it and Sudan has it, and the two have been in business for years. But the Sudanese say their bond with China runs deeper than any oil well and goes back more than 100 years — to a man who proved the adage "the enemy of my enemy is my friend." Maj. Gen. Charles Gordon was known as "Chinese" Gordon to his fans — none of whom were even a little Chinese. In the 1860s, Gordon was a star in the firmament of the British armed forces — the go-to guy who made his way to China to help secure Britain's trading rights there. "Charles Gordon spent some years in China as a British representative during this Imperialistic era," says Maymouna Mirghani Hamza, who teaches history at Nileen University in Khartoum. Gordon is well known in Sudan, where he headed after making a name for himself among the Chinese. Hamza says Gordon went to great lengths to force British influence in China — apparently at great expense to the Chinese people. "Maybe he did it in excess," Hamza says. In the 1860s, then Capt. Gordon — all 5-foot-5-inches of him — helped promote Britain's interests in China at a time when Britain was itching to sell opium there. Imperial China had outlawed the opium trade, but the Opium Wars humbled the emperor and won lavish trading privileges for Britain and other Western powers. It was a humiliating era for the Chinese, made all the more bitter on the day that Gordon personally oversaw the burning of the emperor's summer place. Gordon later fought in one of history's bloodiest rebellions, in which tens of millions of Chinese died. "He troubled the Chinese very much. And so they were watching what happened to him and his fate. And his fate was here, in the Sudan," says El Said Ahmed Abdulrahman Al Mahdi, the grandson of the man who later received Gordon's head on a stick. The elder Mahdi, a bona fide hero in Sudan, was a self-proclaimed descendant of the Prophet Muhammad, and he raised an Islamist anti-colonial army that brought the British low. He and Gordon, a former governor of the Sudan, reportedly held one another in high esteem. But on Jan. 26, 1885, the Mahdists ran their swords through Gordon on the steps of a palace that he'd had built in Khartoum — and then they cut off his head. The Mahdi army was fighting for Sudan's independence from all foreign influence. "For three days, the city was at their mercy," Maymouna Hamza says. "Many people were also killed — Egyptians, Turks, Greeks." It remains Sudan's most astounding military victory. News of Gordon's death raced across Africa like a brush fire in a high wind. The Mahdi did not live long enough to see the British exact revenge, but at his grandson's opulent home, there is a portrait of the Mahdi in a white turban, his serious face in three-quarter light, black eyes staring quietly into the middle distance. He has a nose so regal, it could be minted on a coin. His grandson, Abdulrahman, says the Mahdi's achievement cannot be underestimated. 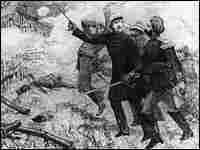 It was the first major defeat of Britain's colonial forces since the Yankees handed them their hats in the New World. "The Mahdist movement awakened the peoples who have been colonized and governed by the Europeans and so on," Abdulrahman says. "It affected all the Arab world. All the Eastern World. People from China heard. The Chinese, in fact, know very much about the Mahdist movement. " Today, Chinese visitors to Khartoum want to see exactly where Gordon fell, says Ali Abdullah Ali, an economist in downtown Khartoum who has written a book on Sudanese-Chinese relations. Ali, like nearly everyone else here, says the story begins on the day Gordon expired, and so far, it has no ending. "The Chinese feel we have executed a vendetta for them, you see," Ali says. "We have revenged for the Chinese, you know, by killing Gordon." Today, China is Sudan's No. 1 trading partner, but Gordon didn't seal that deal — oil did. The Bank of Sudan estimates that the country sells well more than 80 percent of its crude to Beijing. But what gives the relationship flair is the tale of the Mahdi and old Chinese Gordon. It is widely believed that the Mahdi had wanted Gordon captured alive. Historians say he had plans to convert the general to Islam, or to trade him to Britain in a prisoner exchange. But perhaps even in defeat Gordon would have preferred to remain in Sudan. In his writings, Gordon said he would "sooner follow the Mahdi than go out to dinner every night in London." That may be why the locals call him Gordon of Khartoum.